Globular clusters are dense collections of stars usually orbiting within a galaxy. Omega Centauri is the largest local example of a globular cluster. Most of the Milky Way’s globular clusters are orbiting outside the galaxy disc. An explanation of the existence of globular clusters according to the AGM Theory is set out in Behaviour. This explains that they are an example of the AGM Excluded state. They are so dense that the AGM Boundaries of most of the stars have combined. It also explains that globular clusters may contain very old stars but they are relatively short lived objects. For this analysis the mass of the globular clusters was estimated from their apparent magnitude and their distance. To do this they were assumed to comprise of only sun-like stars. As an example the mass of the stars in Omega Centauri calculated this way is 1.57 × 1036 kgs (7.85 × 105 sols). However the mass of Omega Centauri quoted in many other sources (for example here) is about 1 × 1037 kgs (5 × 106 sols). This analysis continues on the assumption that the first figure is most accurate estimate of normal matter mass. The radii, volumes and densities of the clusters were then calculated. This allowed each cluster to be plotted as a blue cross on the graph on the right. These are shown in the context of the red Dnx line and the Bok globule data as developed in Investigation. Note that the density of a cluster is not necessarily the AGM Exclusion Density. The cluster’s AGM Boundary is somewhere within the cluster. However this affects each cluster and the point does not detract from the discussion below. It can be seen that most globular clusters are well above the density that would be predicted from a simple comparison with the red Dnx line. Most clusters fit into a fairly tight group on the graph but there are several clusters scattered outside the group at lower densities and/or lower radii. There appears to be a cut-off marked by the dotted blue line above which there are no clusters. The cut-off is quite close to where the clusters are most tightly grouped. It also appears to be approximately parallel to the lower part of the red Dnx Line. The orbital velocity of objects in the galaxy does not vary much with radius (as is the case with Andromeda described for example here). Away from the galaxy plane the anti-gravity matter is moving relatively slowly. As a result for most globular clusters the relative speed of the anti-gravity matter does not vary much either. Each globular cluster is orbiting the galaxy and feels an anti-gravity matter wind. This distorts and stretches its AGM Boundary as shown to the right. The AGM Pressure at the leading face of a globular cluster is increased due to the anti-gravity matter wind. This is a conventional stagnation (ram) pressure. This drives the anti-gravity matter closer to the centre of the cluster than would be the case if there were no wind. Anti-gravity matter drag reduces the kinetic energy of the stars within the cluster and makes the cluster denser. The result is to create a second Dnx line for the cluster that is consistent with a higher AGM Pressure caused by the stagnation pressure of the anti-gravity matter. This is in the region of the blue dotted line. Any cluster that happened to be above the blue dotted line would be too dense to be in contact with the anti-gravity matter around it. Its outer envelope would relatively quickly expand as higher energy stars escape until it makes contact with the anti-gravity matter, making first contact at the leading face. This expansion would move it on the graph above in the direction of arrow (1). Having made contact with the anti-gravity matter its radius would stabilize except that over time it will lose stars and mass to the anti-gravity matter wind. It would follow arrow (2) parallel to the blue dotted line. Eventually clusters are broken up by the anti-gravity matter wind and lose their identity. Their average density drops below the AGM Exclusion density and the AGM Boundaries of their stars separate. Density Factor is used in the following analysis. Density Factor is the ratio of actual density to the density that would be predicted by an extrapolation of the lower red Dnx Line for the same radius. For example many clusters have a Density Factor of around 100. That means they are around 100 times denser than we would expect for a cluster of that radius that was on an extrapolation of the lower portion of the red Dnx Line. Density Factor is proportional to an object’s displacement perpendicular to the lower sloping part of the Dnx line as shown on the right. Colours have been added to the graph on the right and the graphs below to identify different populations of globular clusters. Red, orange and yellow points represent globular clusters that are within about 40 kly of the galaxy centre. They are differentiated based on their distance from the galaxy plane as shown on the right. Green and blue points represent globular clusters that are further than 40 kly from the galaxy centre. The globular clusters that are within about 40 kly of the galaxy centre (the red, orange and yellow ones) show a relationship between density factor and distance from the galaxy plane. 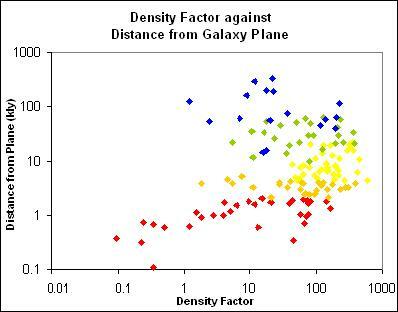 Most such clusters close to the galaxy plane have a low Density Factor and all such clusters further away from the galaxy plane have a higher Density Factor. According to the AGM Theory this is because close to the galaxy plane the anti-gravity matter is orbiting as well. As a result for clusters which are orbiting in the galaxy plane their speed relative to the anti-gravity matter is reduced. Away from the plane the anti-gravity matter is moving relatively slowly (relative to the galaxy centre). Those clusters feel the full force of the anti-gravity matter wind caused by their own orbital speed. The clusters that are away from the galaxy plane do not stay away from the galaxy plane all the time. Their orbit is at a steep angle to the galaxy plane so they pass through it twice per orbit. This accounts for the small group of red clusters that have high Density Factor. They are passing through the galaxy plane quickly whereas the red clusters with low Density Factor stay close to the galaxy plane all the time. It could be suggested that the reduction of Density Factor for clusters near the galaxy plane arises not because of anti-gravity matter but because globular clusters there are more likely to be obscured by dust in the plane. They will therefore appear to be dimmer and less massive. However the reduction observed is a factor of about 100. This would require that only 1% of the light from the cluster is getting through to the earth. In that case we would also expect some correlation between Density Factor and distance from earth for the globular clusters close to the galaxy plane. The graph on the right shows there is no obvious relationship. Further investigation is set out in Analysis of Globular Cluster Colour. © Copyright Tim E Simmons 2009 to 2016. Last updated 10th August 2016. Major changes are logged in AGM Change Log.